Spiritual healers from across the country joined faith leaders in the red dunes of Kwanyana, the epicentre of the titanium mining threat in eastern Mpondoland over Human Rights Day. They came to pray for the holding and protection of natural, sacred spaces. The gathering and traditional prayer ceremonies were in support of mining affected communities here and in other parts of the country. They know that violation of landscapes by mining threaten access to sacred places and spaces. These are places that have been used for eons for ceremonial purposes, for the gathering of medicinal and ceremonial plants and as spaces to communicate with the spirits and ancestors. 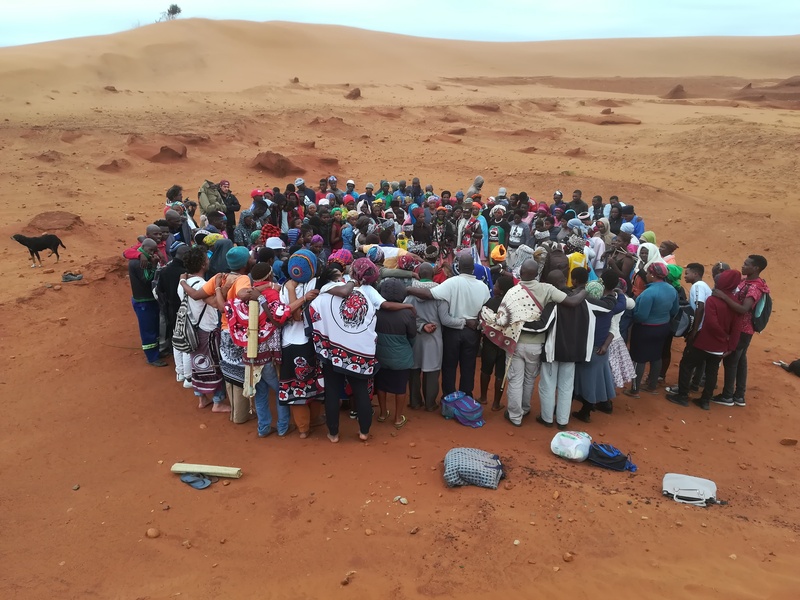 The purpose of the gathering was to raise the voices and role of spiritualists and faith leaders in the struggle against the proposed mining at Xolobeni and to forge greater unity with the affected communities. 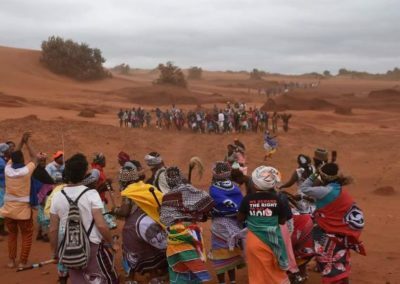 In the words of local spiritual leader, Camagu Danca, “This has much to do with the ancestors because of all the people who have passed over during the course of the fight against the mining”. The visitors came from Limpopo, Mpumalanga and the Northern Cape. They included Dion Kummt’sa Ben Diere of the Khomani San, from the !Xo tradition in central and northern Namibia, Zola Xashimba a naturalist, herbalist, indigenous healer and traditional wisdom keeper, Frelimo Mnisi an initiate in healing traditions and practices from Thokoza Retreat Home in Soshanguve, Majola (Khanyisa Buti) a musician and artist, Litha Booi a South African actor, known for his role in the SABC1 mini-series uGugu no Andile, Pooven Moodley, a human rights lawyer and Executive Director at Natural Justice, an NPO specialising in environmental and human rights law in Africa and Kevin Bloom a writer, journalist and programme director of the Vuka Institute. 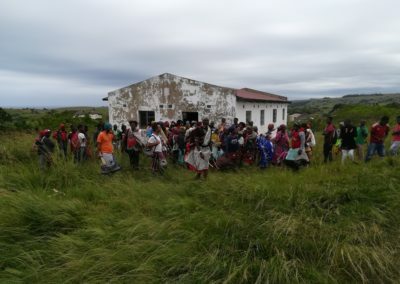 Logistical and organisational assistance was provided to Camagu by Sinegugu Zikulu (an African Independent Church elder and medicinal plant and biodiversity specialist), Siyabonga Ndovela and SWC, an NGO that seeks to support residents of the coastal villages of Eastern Mpondoland in protecting their land, livelihoods and culture. The group overnighted at Vuna Valley Backpackers in Port Edward on 19th March where they were briefed by leader of the Right to say No to Mining! struggle, Nonhle Mbuthuma of the ACC (Amadiba Crisis Committee). The following day they were met by Siyabonga and healers from the Nyavini area at Camagu’s homestead above the Sikhombe Estuary. 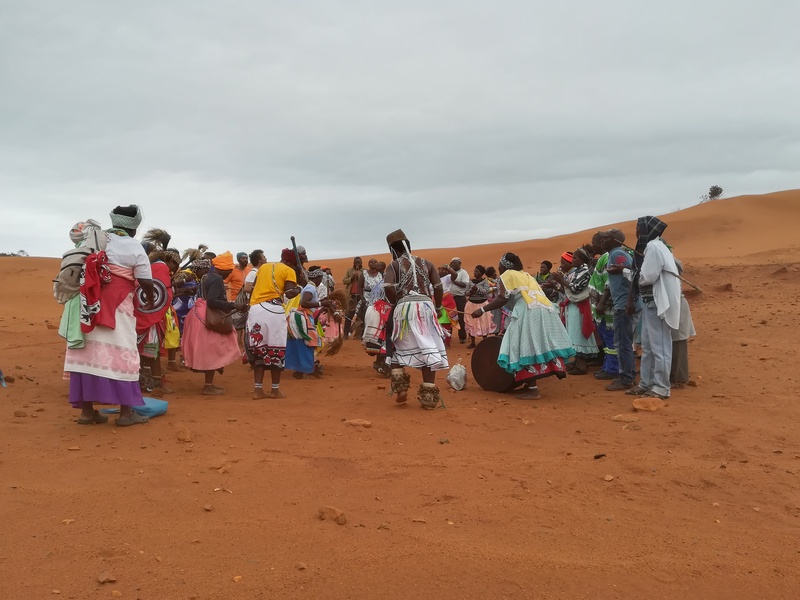 After a welcoming ceremony and the sharing of home-made mqombothi, the convoy moved to Komkhulu, the meeting place of traditional authorities, where they were greeted by local healers, church leaders and over 200 community members. The hall was overflowing, everyone eager to hear about the visitors, the purpose of the gathering and the planned proceedings. Many were forced to stand outside. 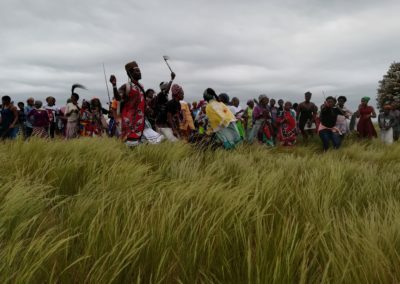 Threats of disruption by a pro-mining group had been dispelled by members of the affected communities who mobilised people around the planned gathering sites to protect and guide the leaders into the area. Camagu then led the procession through the grasslands to a point overlooking the red dunes and the chosen gathering place. 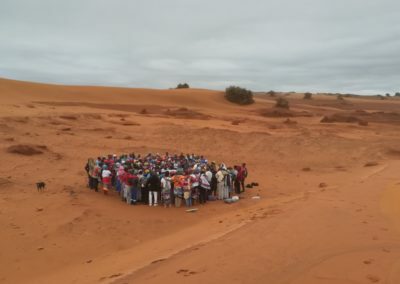 The community held the space at the entrance to the red sands while the procession of healers and faith leaders went down into the dunes. For over an hour, ceremonies of song, dance and prayer were conducted by the leaders. Later they were joined by the community for further celebrations and a final prayer session. 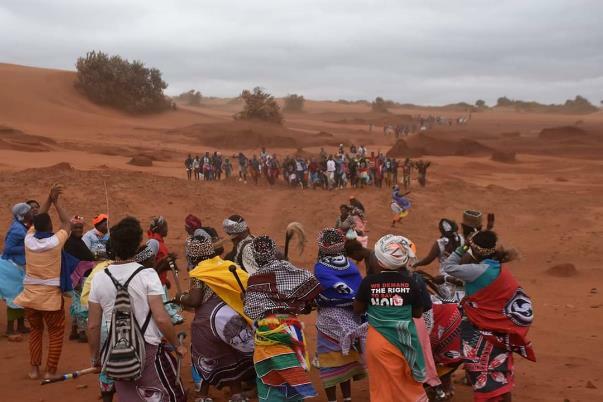 After the ceremony, people walked back to Komkhulu and dispersed along the way to their homes while the visitors returned to Camagu’s for the night. (There are audio recordings of a conversation with Frelimo, who led much of the ceremony. He describes some of the content and meanings of the proceedings). 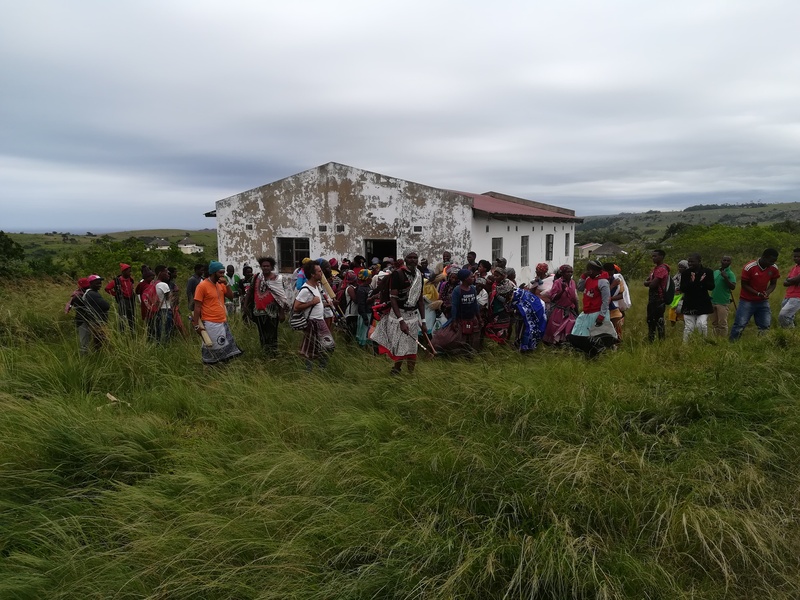 The following morning, Human Rights day, marked the third anniversary of the killing of anti-mining activist Bozooka Radebe. The leaders were welcomed at Sigidi village where they led prayers at a large tented rally organised by the Amadiba Crisis Committee. The healer and faith leader visit to Eastern Mpondoland was planned as a low-key sacred event, but unanticipated support from the broader communities of Nyavini, Kwanyana and Mtolani highlighted the importance of the universal struggle for land and sacred spaces and the role traditional healers and faith leaders can play in fostering community cohesion and well-being. 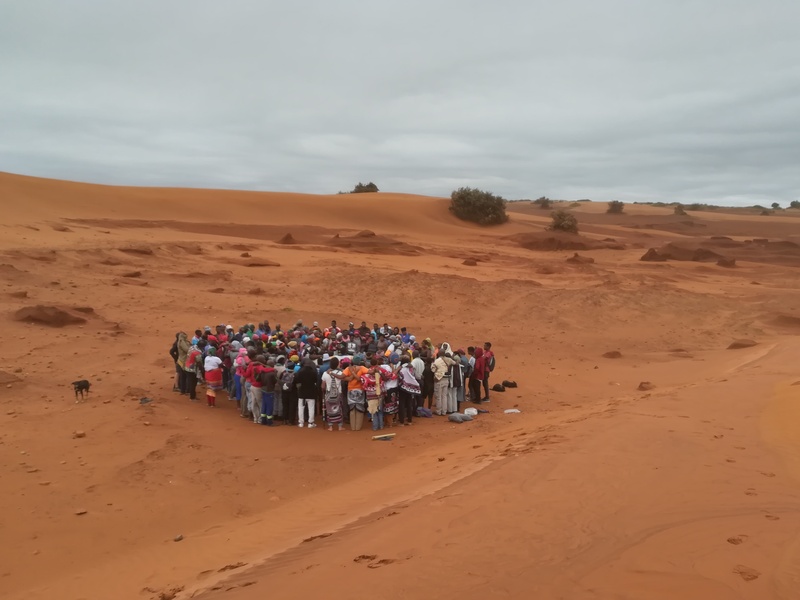 This ceremonial visit by a small group of healers from around the country helped people realise that others stand in solidarity with them over their struggle. 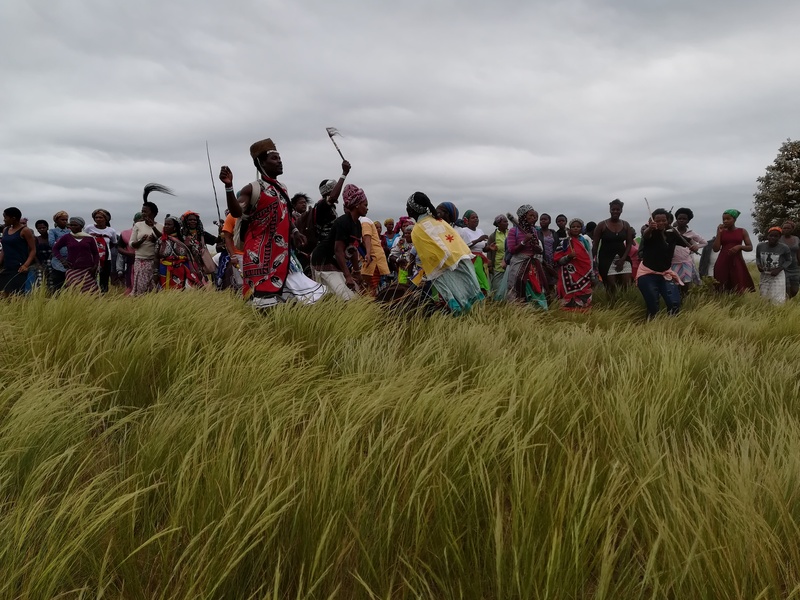 The ceremony is not to be an isolated event, it marks the dawn of something bigger, starting with a planned children’s tree planting ceremony which Comagu has been tasked to organise with local healers and faith leaders.